Just noticed it will be a Special Valentine's Day - 2-14-2014 this year. Valentine's Day golden birthday? I haven't held any Spinner drawings in a few months, so here's the ice breaker. 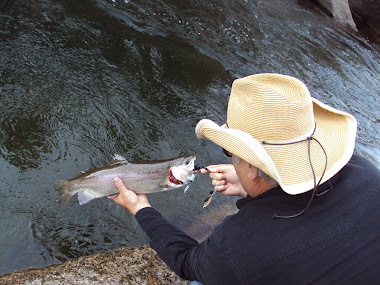 February 2014 free Fish Creek Spinners drawing - Comment the blog post to enter. The Comment form is found at the bottom of the post. It's going to be a dozen beauties! Trout spinners small and medium. A $40-$50 value. Share those URL's, Facebook and Google Plus posts and spread the word - the more the merrier - and the more the winners. You get a second entry for sharing. However only comments on my initial posts count for entry. I'll assign a number to each valid entry and then use Random.org to pick winners. One winner every ten entrants. e.g. if I got 25 entries, I'll set it to pick 3 numbers out of a range of 1 to 25. It's random, so they might all be in the first 10, who knows. Great odds. If we get 100 entrants, that's the cutoff. Sign up quick. Twelve Spinners are 1/8oz Glass and 1/5oz Metal Armadillo's, 1/10 FireAnt and 1/8oz QuadProps, a 1/8oz Transformer and a few one-of-a-kinds like the Manatee. These Spinners rock my boat! 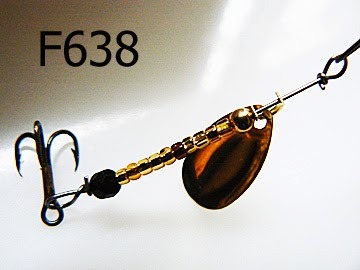 They introduce a new blade, changed hook attachment, and new mainstream a new hook dressing - the June Bug Blade; slip R bend hook attachment, and zonker strip banded trebles. June bug blades are unique and different. They don't use a clevis, similar to an inline blade, but also have a secondary brace that provides two points of rotation on the wire. Two wear points on the wire, generate extra noise and vibration. June Bug blades spin well at ultra-low speeds and give off a very consistent strobe-like flash as they rotate. Pretty cool blade. They've been used on trolling cowbells for many years. 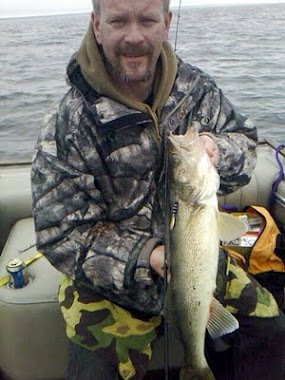 I decided to try them on spinners, and now have 3 size variations available, plus a walleye version. I first saw the slip R bend on a Blue Fox. 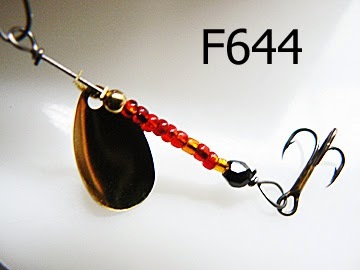 This attachement fits will with zonker banded trebles, salmon lures, and any spinner that is fished in a variety of waters where regulations about barbed vs barbless are dealt with. The Transformer uses a big tail bead behind the blade. This bead has a large center hole, twice the diameter of the spinner wire. The extra space allows the spinners wire to be bent back (R bend) and slid back into the bead, leaving a loop for the hook. You can open and close the loop by sliding the bead forward or backward on the wire. The nice thing with the June Bug blade, is that you can also spread the brace to take up slack on the wire. Just not too much in either direction , else it will bind or weaken the brass. 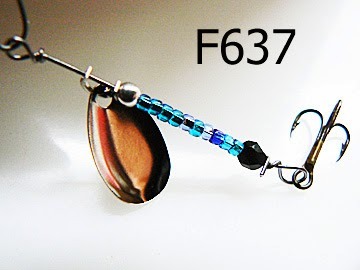 When the bead is slide forward, the loop opens to form the R and you can change out hooks, replace zonker colors. 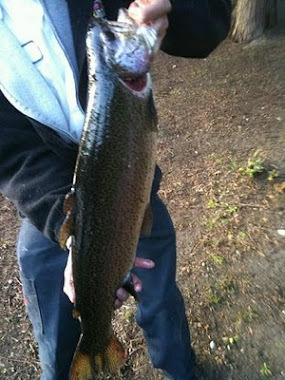 Zonker banded trebles are another evolutionary break-through. 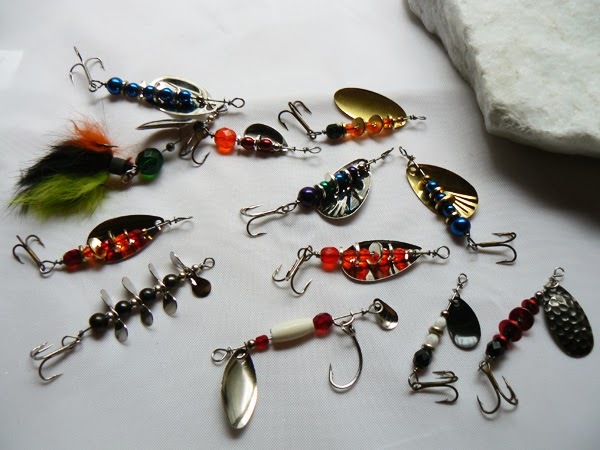 I started out using bucktails on the Tranformers and other spinners for dressed hook options. Tying bucktail on treble hooks is kind of tedius. There's three sharp barbs to contend with doing your wraps. Get it about done and start half hitching and snap the thread breaks...You know the feeling. We had been making zonker spinnerbaits for some time, tying the strips and wraping shoulders, made a nice looking spinnerbait. A few years earlier, browsing through a Netcraft catalog, I found and bought Skirt Banding Tool. Never used it as I found a great wholesaler of banded skirts. Looking at purchased banded Skirts, skirt bands, and Zonker Strips, I dug out the Banding tool and got creative. 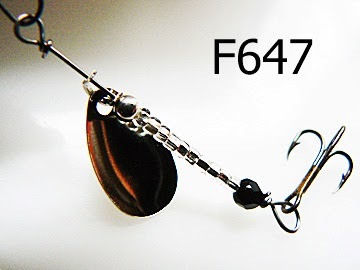 The result.....Zonker banded dressed hooks - now available as hook options. Fun choices! 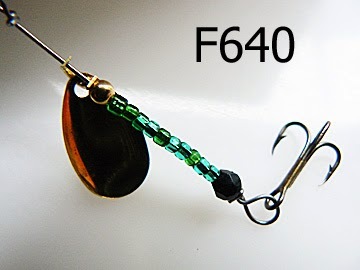 There you have it, the spinner for this week and future fish pictures is the June Bug Transformer. Eighteen color variations and more dressed treble choices in the Other Category. Oh, the transformer part of the name references how it's look can change with a new banded treble or different hook type - barbed treble, Single, dressed barbed treble, dressed barbless treble, dressed Single, etc. You should see a mini-earth slowly revolving over to the left. If not, refresh the page. The widgit loads each launch, but if you've cached NOTL blog in a prior visit, you may not initially see it. It was tagged with a source, so I went and took a closer look. I really like it. The blogger stats don't show city, just country. Although not a pinpoint location, it's a far better look at location sensitive traffic. Oh what the heck, I'll put the snippet in the post. This is the seasonal version, so it's showing some snow! Little red dots are prior visitors, and the expanding white circles should be where it thinks you're at, I guess interpreting the visits IP address. A few more Revolver observations worth mention, Mouse down on the globe, you can stop or speed up rotation with horizontal drag. Vertical drag can give you a view from the north pole or change the angle to another perspective. Then here are all the little icons in lower left to tinker with. As admin, I can go to look at history countries with drill in to individual states, or regions. I'm a happy camper and don't see a downside to it's use so far! Off to a fresh start for the new year with the best intentions and taking another shot at bringing back the spinner of the week posts. That said, here's my vote for first Spinner of the Week choice on the third week of 2014... and since I'm the only one voting, there's nobody to blame but me. This weeks choice is the ultralite 1/30oz Fire Fly - this one in Crystal Green. The Fire Fly spinner is a sweet little unit, barely tipping the scale off zero. 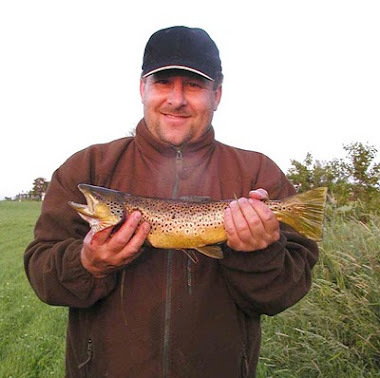 It's not for everyone, but has a sweet spot niche for those anglers fishing around and finding the time to wander off the main flow into those hidden and ignored tributaries that mostly get stepped across while fishing the larger flow waters. Some of my 'best' discoveries ever - beaver ponds holding back runoff and containing flow, hold schools of brook trout and hungry cutthroat. To find them, you need to follow the small flows, sometimes for hours across false peaks and marshy wetlands. The fire fly fishes the waters before you get to the ponds. Surrounded and sometimes covered by thick brush and undergrowth, or lost in marhy wet lands, but still enough flow to cut under banks and hide hungry colorful little fish. 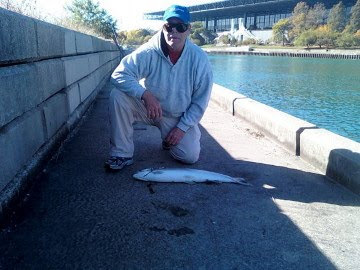 Drop and drift fishing. Stealth fishing into pools the size of a toddlers swimming pool. Ultra-fun discoveries where the 1/8oz and 1/5oz spinners are to heavy and hard to control. Anyway, you know where I'm talking about. Here's a few more colors to look at. There's a few early season deals listed on home page News link popup, provided you have FCS popups enabled. FCS2014ICE Discount Code good for 30% off all Fish Creek Spinners fishing products until 1/31/14. Happy New Year - Stop by and check out the new wide body layout and look-ahead popups. 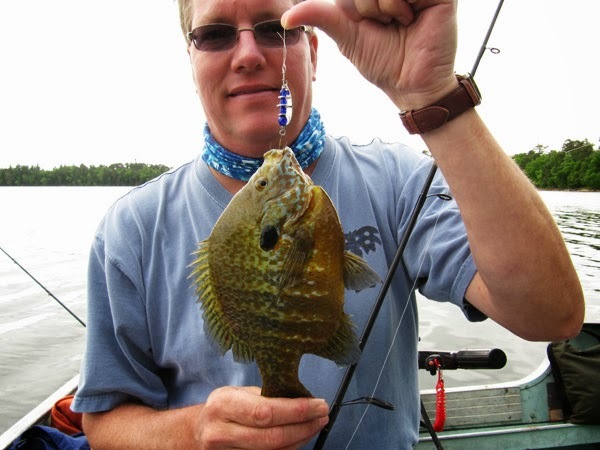 Fish Creek Spinners website - new look and feel! BTW, anybody visiting from Europe, be alert to a new Fish Creek Spinners European Website in UK about to launch. The spinners are on the ground and being unpacked as I write this post. I'll have another Kickoff post when the time is appropriate.